We choosed Niš as location for our 21th EFA-Roundtable speccially to attract the interest of the fire brigades and civil protection institutions of South-East Europe to the plattform of the European Fire Academy and to establish closer links between South-East Europe and the firebrigades of Western and Central Europe. Niš is the third-largest city of Serbia and one of the oldest cities in the Balkans and even in Europe. From ancient times it has been considered a gateway between the East and the West. It is also the birthplace of Constantine the Great, the first Christian Emperor, as well as Constantius III and Justin I. It had a very changeful history: Romans, Byzantins, Bulgars, Serbs, Ottomans rouled here and since 1878 it belongs to Serbia again. Niš is one of the most important industrial centers in Serbia, especially in the electronics, mechanical engineering, textile, and tobacco industries. Niš Constantine the Great Airport is its international airport. There are some direct flights from Berlin, Vienna and other European cities. Transportation can also be organized from the airports of Sofia (125 km) or Belgrad (250 km). We will meet there on the invitation of our Vice-President Jordí Leandro Blanca who is responsible for the fire brigade and security of a big petrochemical complex in Tarragona. If you have proposals, please inform us. How to deal with major Disasters – What should be the best European response? If you can not attend the Roundtable please inform your Colleagues who maybe interested in the Subject. Mr. Broemme and the EFA-team will be glad to see you again in Brussels. In the rooms of the Belgian Ministery of Interior. 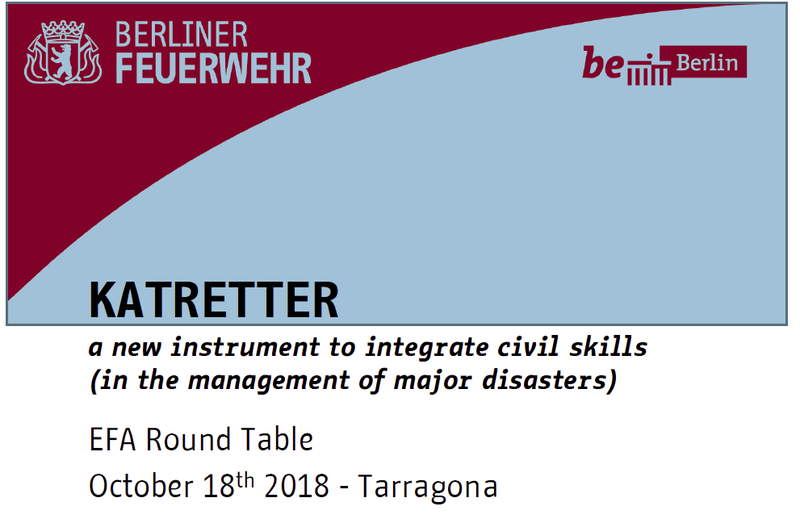 One of the main subjects of discussion will be „How to deal with major Disasters – What should be the best European response„. The exact Program will follow next month. The old board is the new board! The EFA President Albrecht Broemme and the 2 Vicepresidents Jordí Leandro Blanca, Tarragona/Spain and Magister Robert Stocker Vienna/Austria are reelected by the General Meeting of EFA on 13th of February.